Why Acoustic Ceiling Restoration is better? | North Hills Office Services Inc. But what do you do when your acoustic ceiling is damaged? Is replacement always the best option? 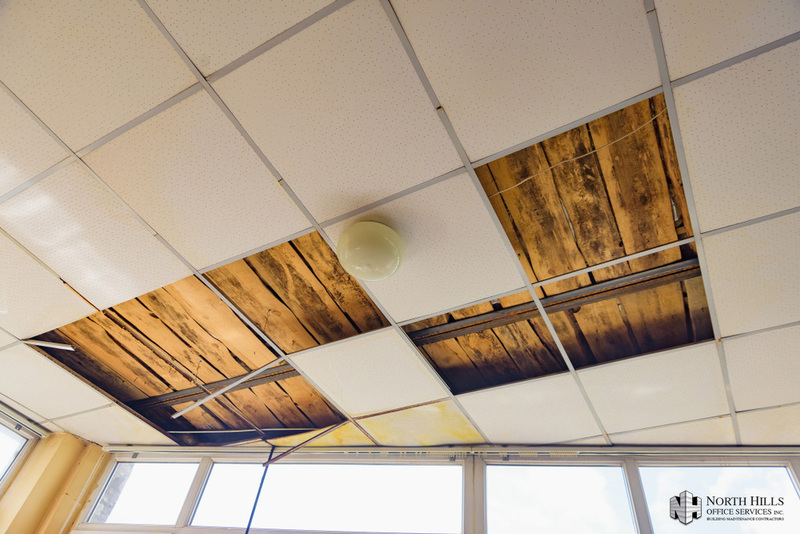 When it comes to dealing with aged/discolored acoustical ceilings, the answer may surprise you. Building owners no longer need to spend a lot of time and money to replace their ceilings. Retail store remodeling is typically completed between closing time (10 pm) and the morning arrival of store personnel (as early as 6 am). When removing and replacing acoustical ceilings, that envelope of time is seldom adequate to do more than one section per night, until the project is completed. It is common, in fully merchandised facilities, to restore 8 – 12,000 square feet of ceilings in one night, during that envelope of time described above. Larger contractors have been known to complete as much as 20,000 square feet in one night. The application of an acoustical coating results in a like-new finish that improves light reflectance and presents the option of designer colors. Even in the case of inexpensive 2’x4’ fissure tiles, ceiling restoration typically runs less than one-half of the cost of tile replacement and offers the advantage of refinishing the t-bar system and air diffusers at the same time with no additional expense. By re-cycling the old ceiling, solid waste disposal is avoided as well as its related cost. Bring Your Ceiling Back to Life! With over 45 years of experience, North Hills Office Services, Inc., offers high quality Acoustical Ceiling Restoration services in the Metropolitan New York area. We adhere to the industry standards to offer the most dependable acoustical ceiling cleaning and restoration services. Give us a call if your property needs a reliable acoustical ceiling expert. Get a quote here.